This is a tricky market. Most indicators I watch rolled bearish a while back, but are now on the cusp of rolling back to bullish -- yet they're not quite there yet. At times like this, I can often find the answer, or at least a good hint, in the wave counts. But right now, we're stuck in the middle of a wave that's vague at multiple degrees of trend. Which means: I'm not certain what type of waveform to anticipate next. As an example of what I'm talking about: the impulsive decline off the all-time-high, during the third week of May, suggested we should expect at least one more similar wave. Sometimes things are clear that way. But other times the pattern is vague -- and still other times it's downright indecipherable. In my opinion, these are the times where it can be dangerous for a technician to overstep his or her bounds. With any type of analysis, it's easy to let subjectivity creep in and pollute your work. And all of us are sometimes prone to "seeing what we want to see." I try to be as honest as I can when I feel things are uncertain. One has to remember that the market will always "be here tomorrow" -- but if one loses one's capital chasing long-shots and random speculation, there will be no way to take advantage of the good opportunities which will most certainly arise again in the future. The reality is, the rally has extended into territory where things become fuzzy again, and there is no clear-cut answer right now. The market is well within its rights to do just about whatever it wants from here without violating any of the technical rules of the wave structure. I believe anyone who's stating that "a long term top is definitely in place" or that an intermediate low is "definitely" in place is stating that from conviction and bias, not from the technical perspective. Technically, either could be true. So I think we have to keep an open mind to both the bullish and the bearish potentials right now. In this update, I'll try to outline some signals to watch going forward. Let's start off with a ratio chart which helps illustrate the bull/bear conundrum. The chart below is a ratio of HDGE to the S&P 500 (SPX). HDGE is an actively managed short fund ETF, so it's popular as a "risk off" trade. 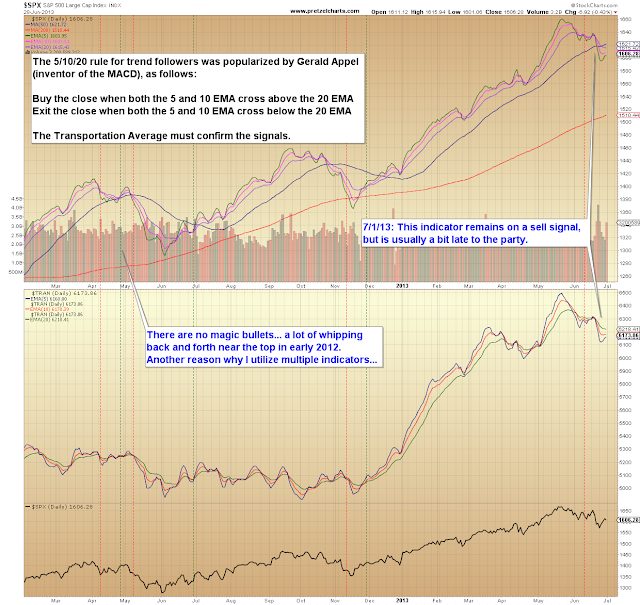 A falling ratio is thus bullish for stocks, while a rising ratio is bearish. For example, we can see how near the 2012 peak, this ratio broke out of a falling wedge pattern, thus signalling a correction in equities. 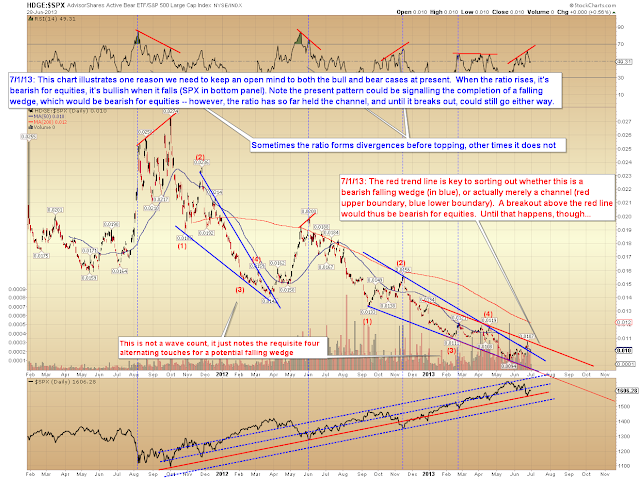 The current market has similar falling wedge potential, but the ratio broke out just enough to leave everything vague. We can see the breakout stopped right where it needed to if the falling wedge pattern is a fake. 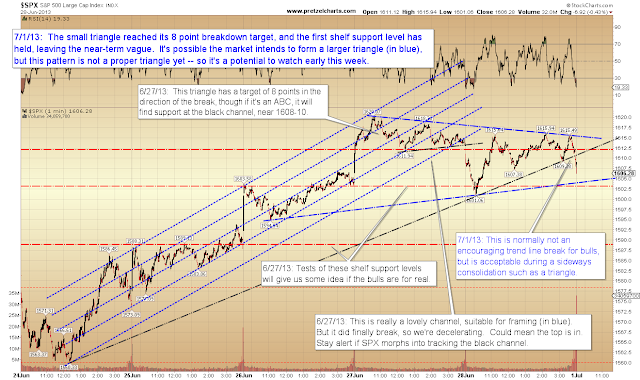 The chart notes explain what to watch. Next, one of the indicators I watch is an exponential moving average trend system developed by Gerald Appel (who also developed the ubiquitous MACD indicator). 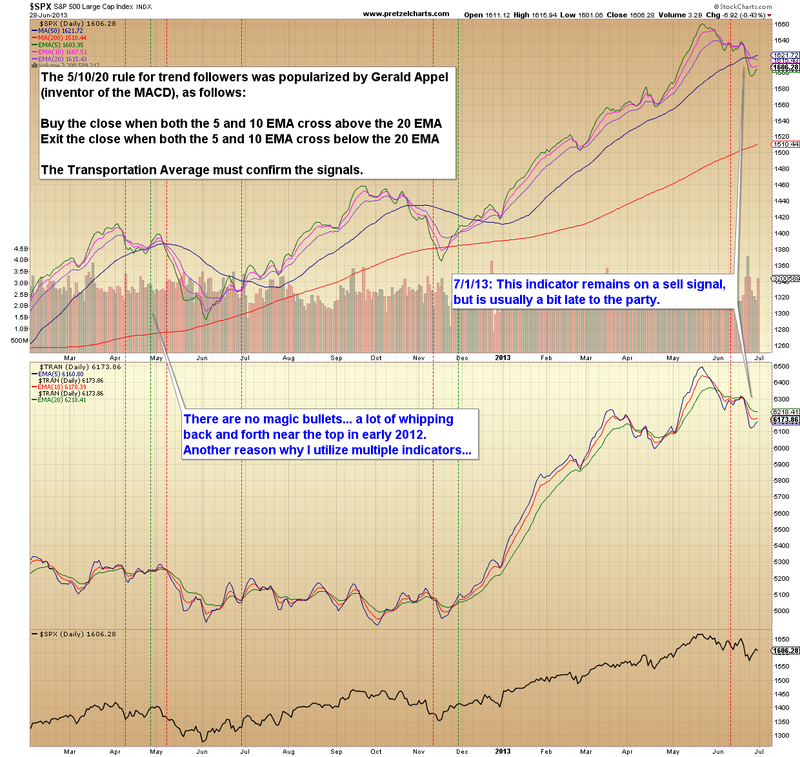 This system remains on a sell signal, but is often a bit late to the party. We probably have to give bears the edge on this one, but it's a very slight edge, because the moving averages are presently turning back up. Bears will need to put together some down days fairly soon to keep this indicator on a sell signal. 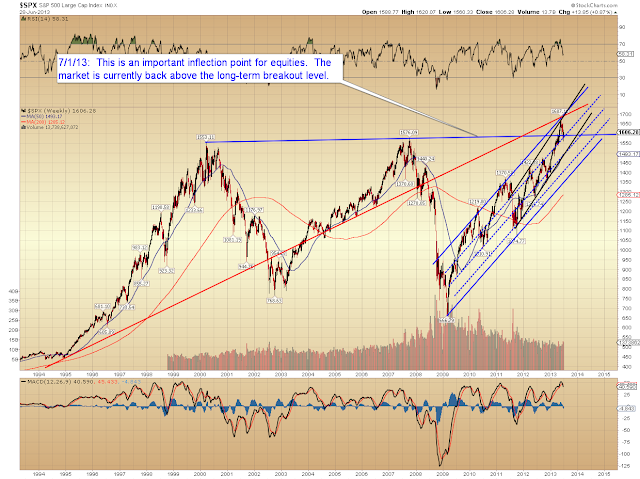 On a long-term level, SPX is trading back above the breakout of long-term resistance. 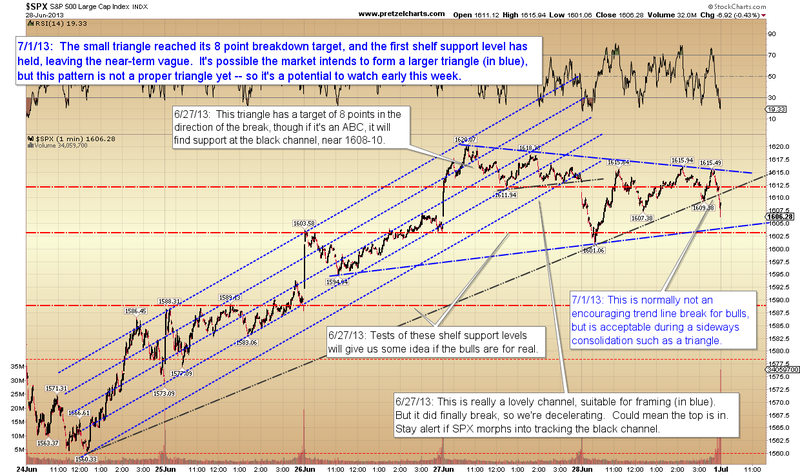 One of the key concepts in technical analysis is observing whether prior resistance becomes support, and vice-versa. 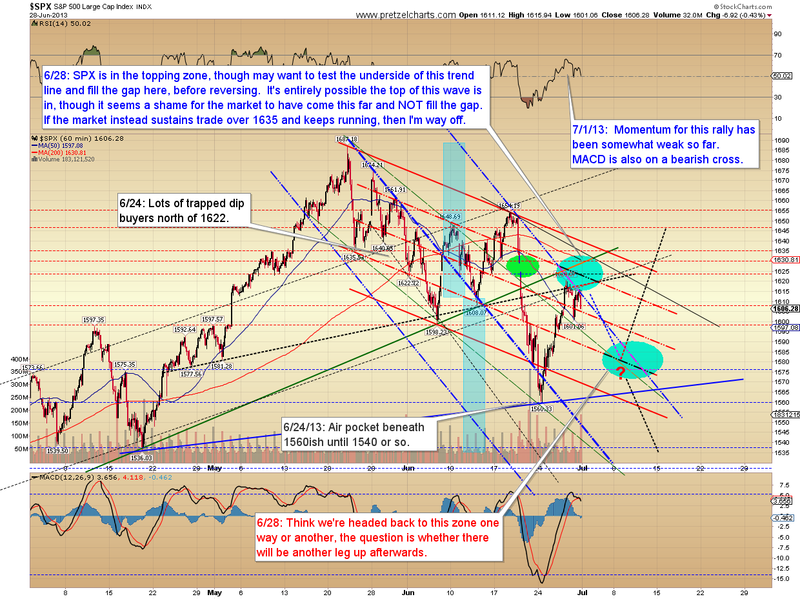 The first test has held so far -- so unless the market reverses back through support, we have to respect this breakout. 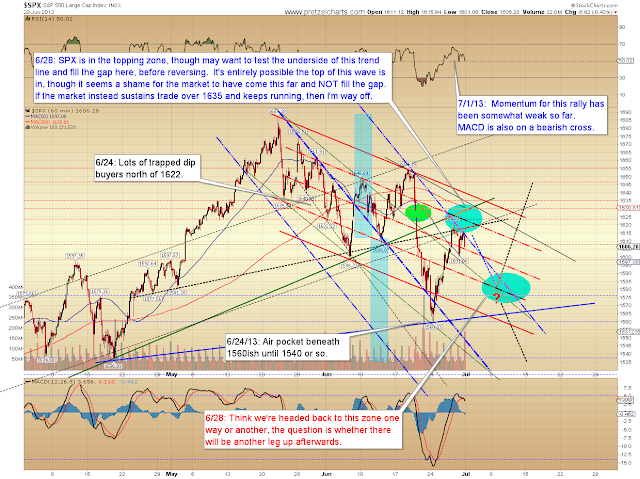 We probably have to give this one to the bulls as long as 1560 support holds. I remain very marginally in favor of lower prices because of the Philadelphia Bank Index (BKX), which I'm inclined to believe is forming an expanded flat. The upshot of charts like this is that, no matter which way the pattern ultimately breaks, they contain price levels which provide information. We probably won't have to wait long to find out if the expanded flat is right or wrong, since BKX is now in the zone where it should reveal an answer fairly soon. 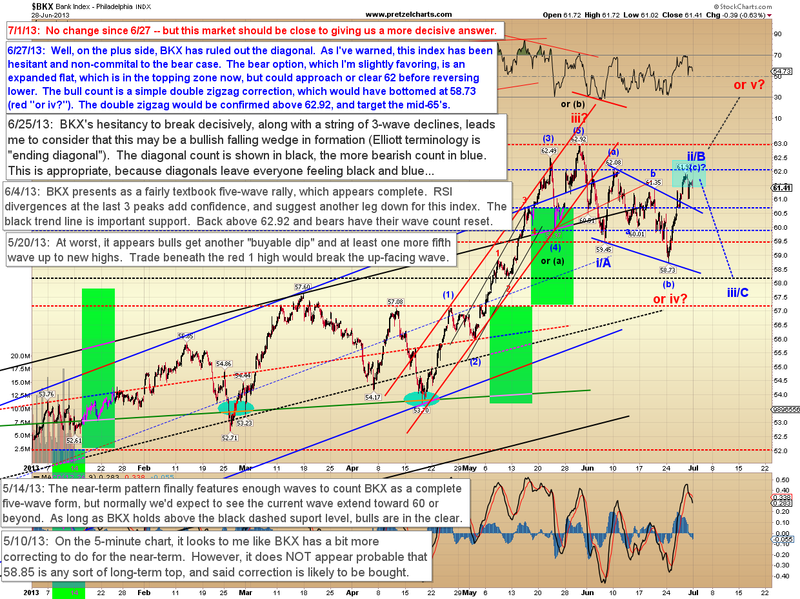 In the last update, I discussed that I felt near-term direction would be downwards, and it was -- however, the market has formed only a three-wave decline so far, which leaves it inconclusive if there's been a trend change at the next highest degree, or if that was all she wrote for the move down for now. On the hourly chart, we can see this could still be simply a back test of the broken intermediate trend line. Bears will need to make a stand within the blue zone, or things will begin to look more bullish from an intermediate perspective. In conclusion, I remain marginally in favor of the bears, but the rally has extended into a zone where bears will need to make a stand fairly directly to keep the odds on their side. Trade safe. Copyright 2013 Minyanville Media, Inc. 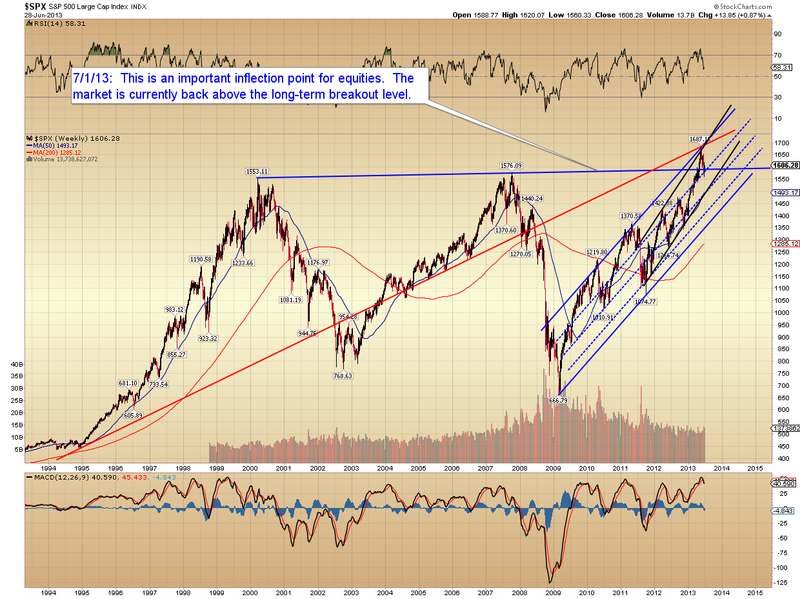 This is a site to view volume and chart analysis chart analysis. This site provides leading technical indicator analysis and provides a great stock screener.